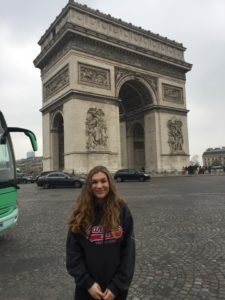 North Queens Community School Grade 12 Student Rhylee B. recently traveled to Europe with her fellow students, teachers and volunteer chaperones for a cultural and historical experience of a lifetime. 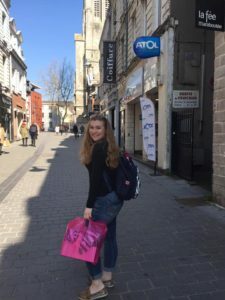 She recently wrote a blog to share her experience with everyone. This March break I experienced the trip of a lifetime. 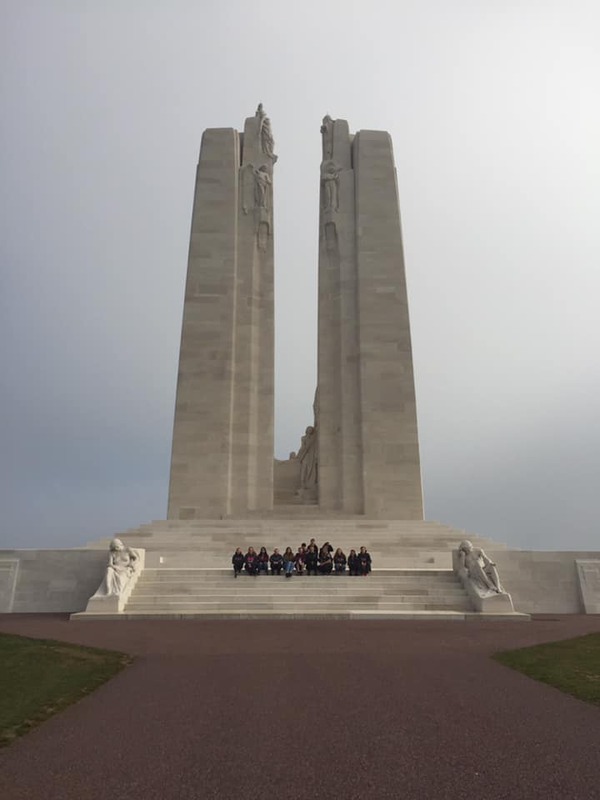 My school, North Queens Community School, recently travelled over 5000 kilometers overseas to Europe to learn about Canadian History and the impact Canadians had on the World Wars. 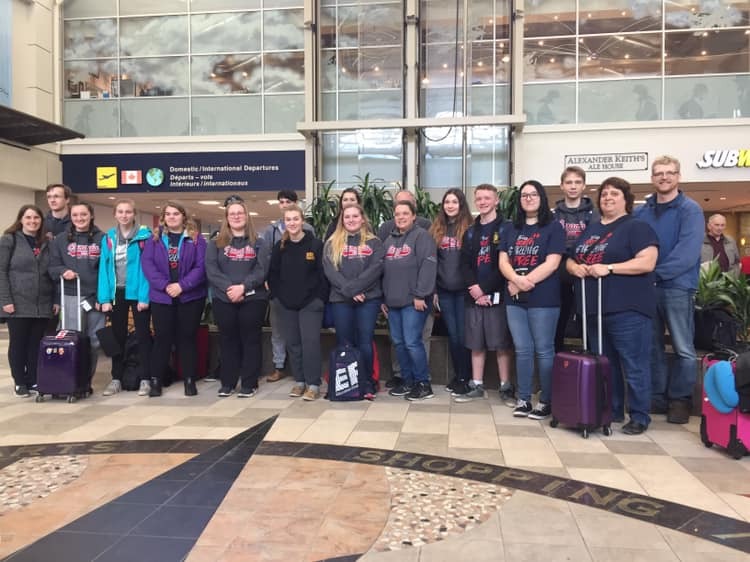 First we flew from Halifax to Montreal, and then we were lucky to have an overnight flight of seven hours to Frankfurt, then a quick little flight to Berlin. We landed at 1pm Berlin time, giving us almost the whole day to explore the city. Our tour director kicked the tour off with a walking tour of Berlin. 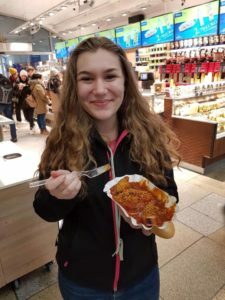 We got to try some traditional German food, like currywurst! After our supper of German mac and cheese, we walked back to the hotel but stopped to see the Brandenburg Gate lit up at night! It was a beautiful way to end our first day on tour. Our hotel was quite nice so we all got a good night’s sleep for the day ahead of us. In the morning, a bus picked us up at the hotel, then we picked up a tour guide for a bus tour around Berlin. Along the tour he told us historical facts about the buildings around us, and Germany itself. 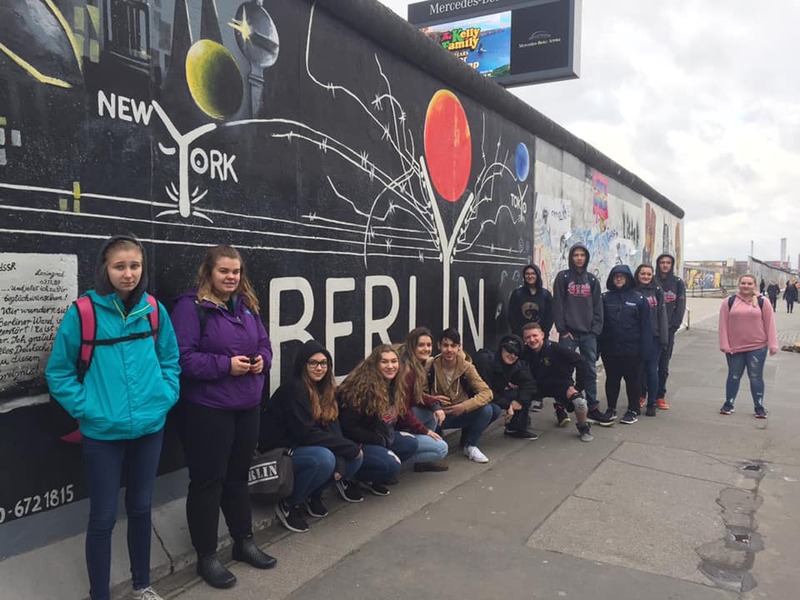 We also got the chance to get off the bus and see the Berlin wall up close! I loved the political expression on the wall through art. The graffiti was beautiful, Berlin has some talented artists among them! 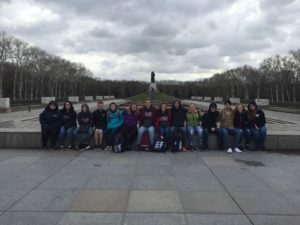 The tour guide also took us to the Treptower Park Soviet Memorial, in honour of the 27,000,000 civilian and military lives lost. We dropped that tour guide off, and picked up another one for our next stop. 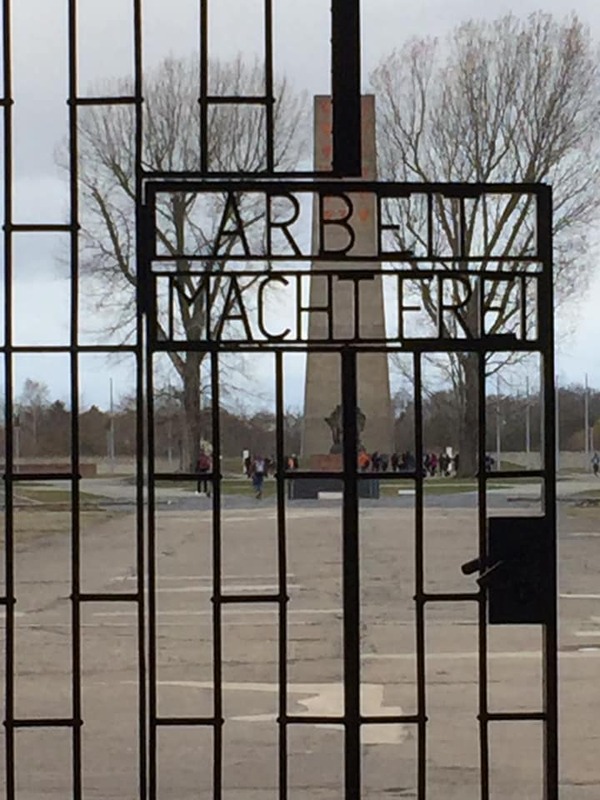 The next tour was in Oranienburg, at the Nazi concentration camp, Sachsenhausen. This was one of the most emotional parts of our trip. 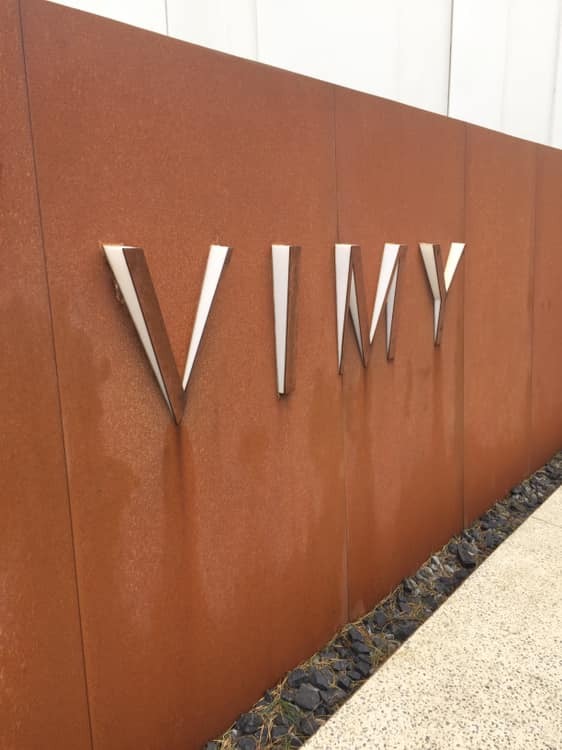 The tour consisted of visiting the the museum part of the memorial first before stepping on to the actual grounds. 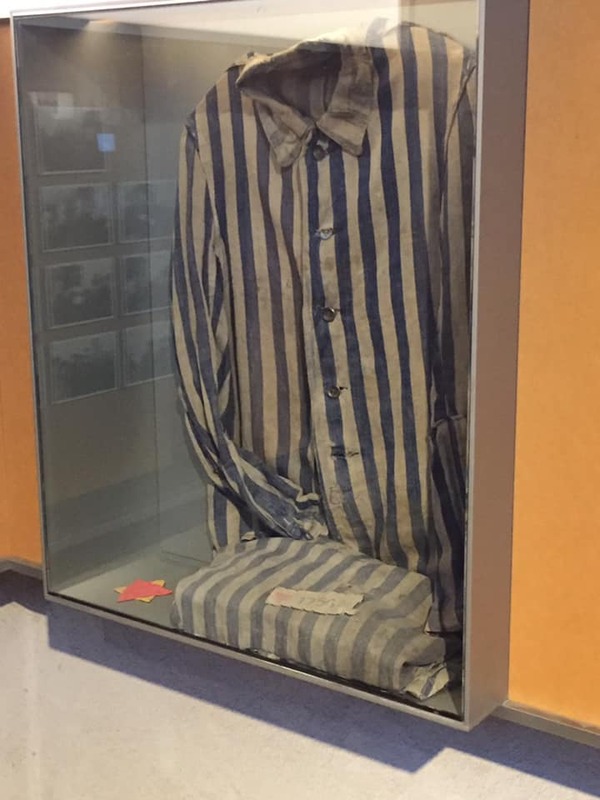 The museum gave us some background about what actually happened at the camp; it wasn’t a Jewish concentration camp, but a Prisoner of War camp where over 200,000 prisoners passed through during World War Two. Over 100,000 prisoners died there from disease, being overworked, and executions. After learning a bit about the camp, we walked inside the grounds. The weather was quite fitting for the tour, windy, cold, and raining. As we walked towards the replica barracks, there was a sign translated from German to “Neutral Zone.” Our tour guide explained that this area was a very dangerous spot 75 years ago. If a prisoner were to step inside the neutral zone, they were automatically executed. 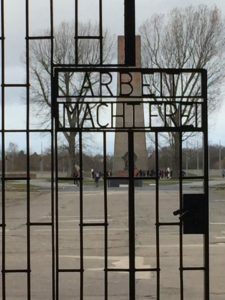 This really stood out to me because we can freely walk wherever we like in the grounds, including in the neutral zone, but during the war that was not the case. The barracks were tiny, close quarters. As we looked to the top of the ceiling, you could see how the paint was peeling off in large amounts. Our tour guide told us that a few years ago, a group of Neo-Nazi’s tried to burn the building down. After that our tour director said there was a political party in Germany with views like the Neo-Nazis have, and in the last election they received 13% of the vote, which to me is an alarming thought. Past the barracks, was the trench where prisoners would be executed, and the foundations of the gas chambers. Beside those were the furnaces that are still left standing. The last stop of the tour was at the monument built to remember the lives that were lost there. 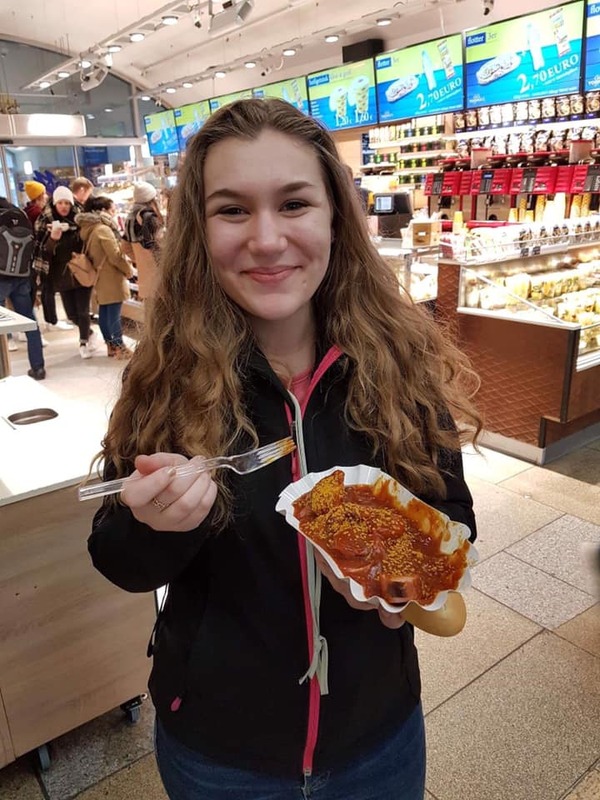 We drove back to Berlin and had some free time to shop before we had supper and headed back to the hotel. That day was sadly our last day in Berlin. 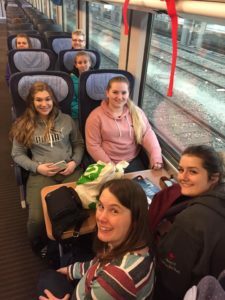 On day four we would be leaving Berlin via train, to the Netherlands! This was exciting for me, because on the last tour I was on the Netherlands was my favourite place! The 6 hour train ride was long, but well worth it. 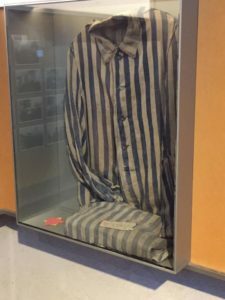 Once we arrived in the Netherlands, a bus took us to the National Liberation Museum. Did you know that there were over 30,000 Liberation babies? The museum was a great learning experience which gained us a new sense of Canadian pride. The next stop was quite personal to us, it was at the Groesbeek cemetery, where all the soldiers we’d been researching for the last two months for the Soldier Project were buried. Some of us made contact with family members and incorporated the family’s wishes for remembrance into our services, others came up with their own way to commemorate their soldier. It was another good day spent celebrating Canadian success, and mourning the lives sacrificed. Our next day was spent in the beautiful city of Amsterdam! 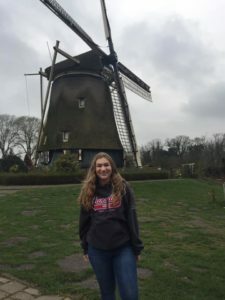 To start the day off, we had a pit stop by a traditional Holland windmill. Then we made our way to the Anne Frank house. I had been there before, but it was a much different experience because this time I had read her diary before visiting, so it felt as if I knew her in a way. Throughout the trip, our tour director took us to many different little towns. The small town of Volendam was my favourite. It reminded us all of Lunenburg! I was right along the ocean, with so many little shops alongside with food, clothing, and souvenirs. 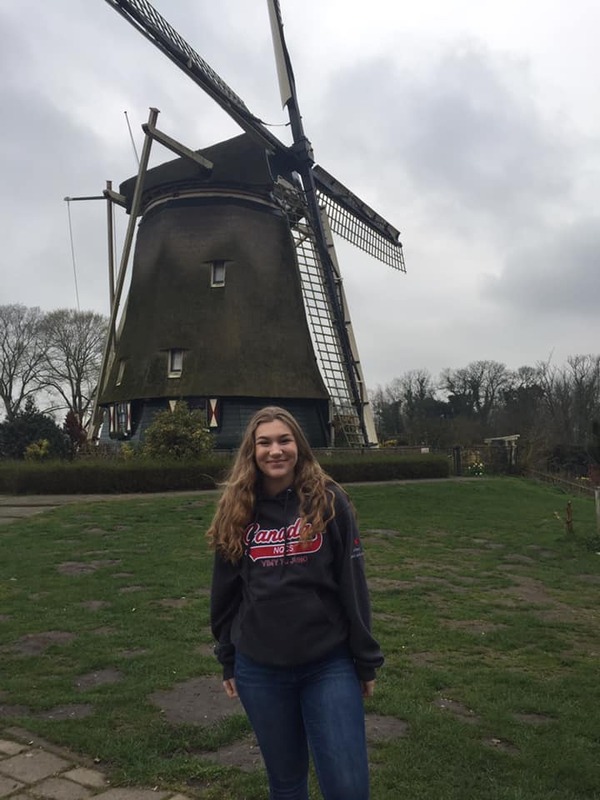 Next we got to experience some real Holland tradition, we watched a clog making demonstration and cheesemaking! We got to taste all sorts of cheese from the Netherlands. 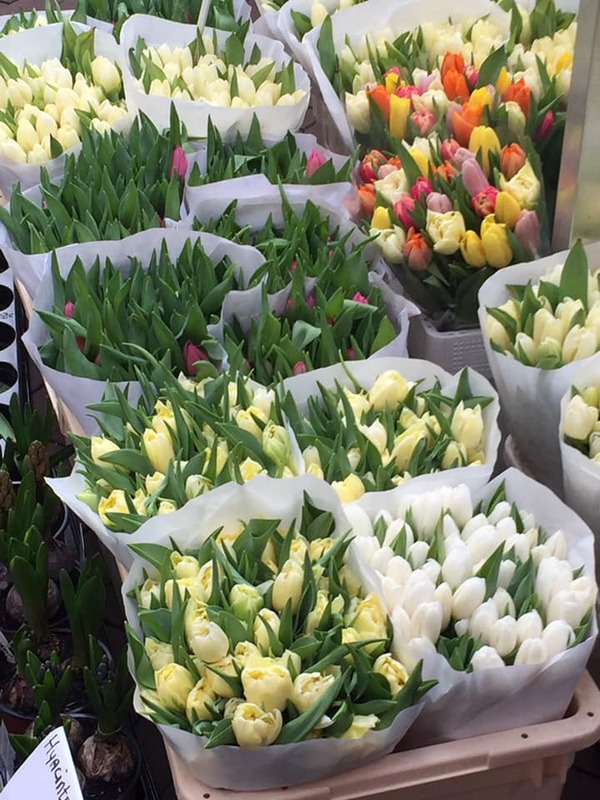 To end the day, we walked through a gorgeous flower market in the middle of the city. 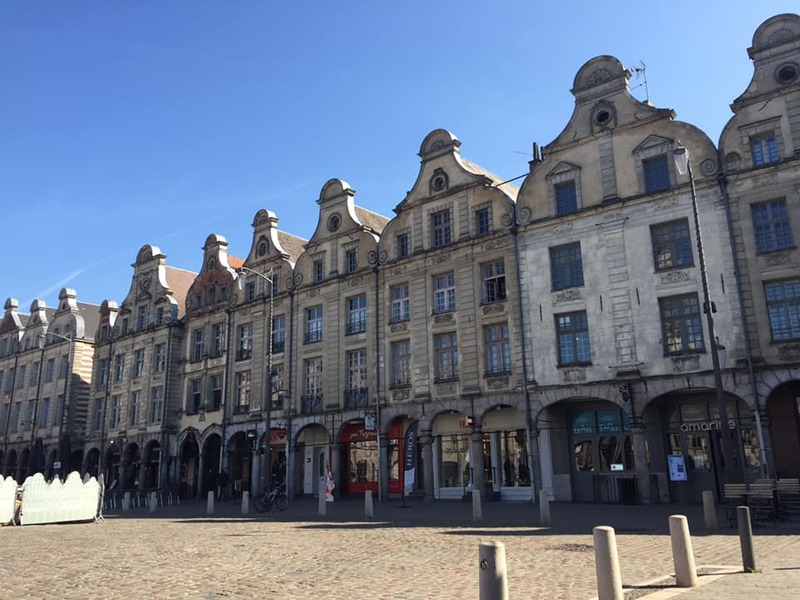 The next day we made the trip to Belgium, our first stop being in a little town called Ghent for lunch. 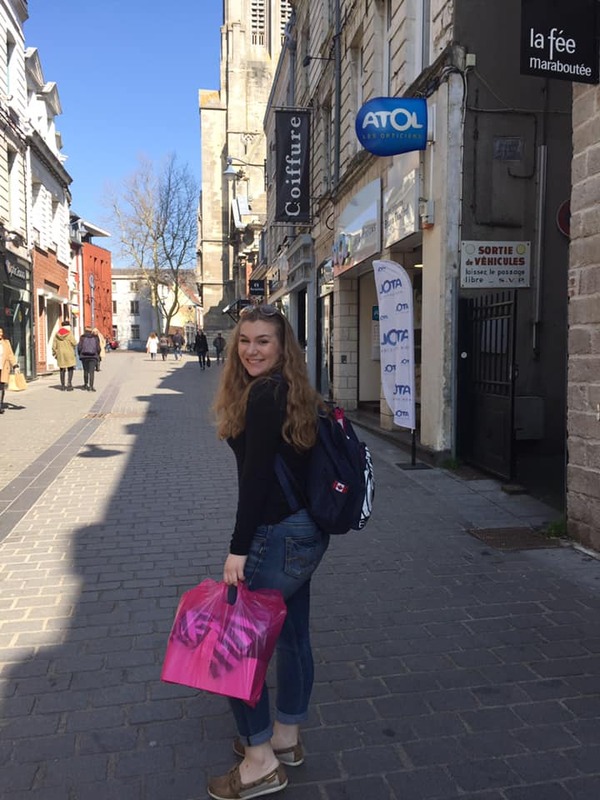 It was amazing to see all the old architecture and churches! We then drove a bit longer into Ypres, to the In Flanders Fields Museum. It was neat to learn about Belgium’s role in the war in a building that was actually one destroyed by battle. Once we’d spent some time in the museum, we were given free time to explore. 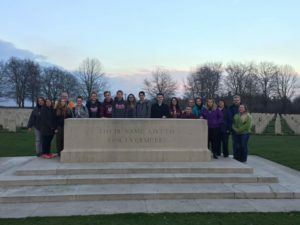 That night we attended the Last Post Ceremony at Menin Gate. The ceremony was one I’d never forget! We ended up travelling through three countries in one day because our hotel was located in France! It was a busy and long day, but a fantastic one! 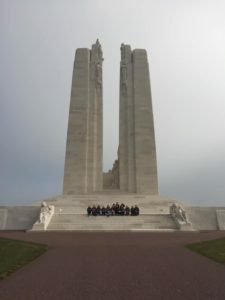 The next morning we visited Vimy Ridge. 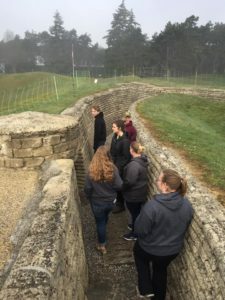 We had a guided tour through the tunnels in trenches, which was interesting because we didn’t get the chance to have that experience there at Vimy 100 in 2017. Then we went up the hill to see the actual monument. 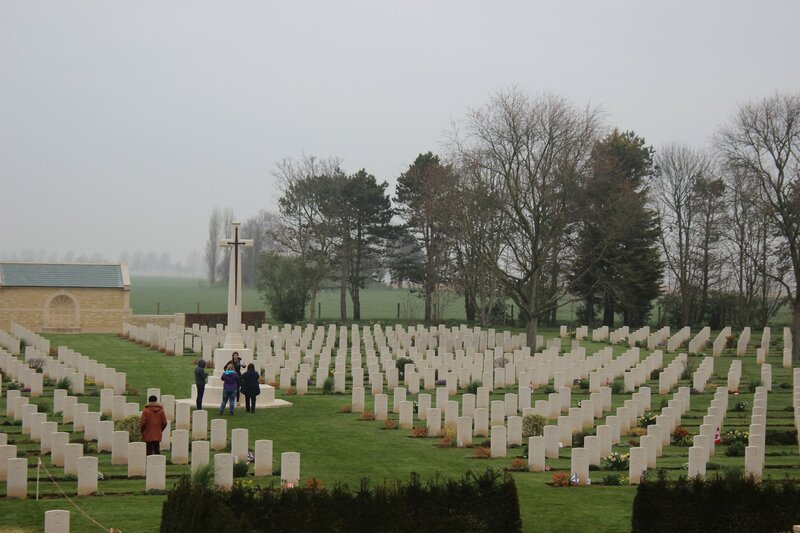 We then went to more Canadian ground, at Beaumont Hamel. It was one of my favourite history parts of the tour last time, and still is! We got to go through the trenches with a guide who told us all about the history of the land. It was so nice to see some Canadian faces working for Parks Canada! For lunch we stopped in the cutest little French town called Arras, which is another one of my favourite places I have ever been to! After lunch we started our 4 hour trip to Caen, another small French town, where we’d be spending the night. 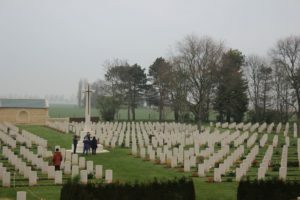 We started our day in Caen, then drove to the Beny Sur Mer Cemetery and visited the site of the Ardenne Abbey massacre. 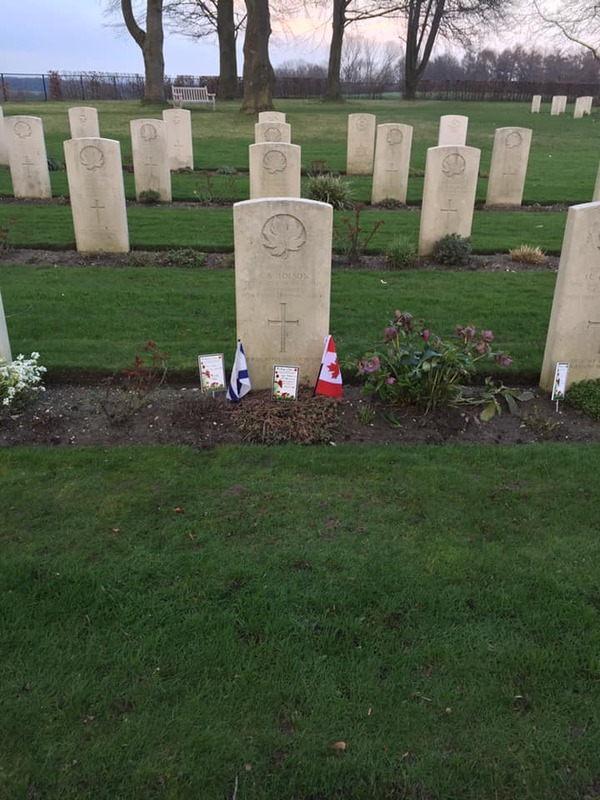 This was another very emotional part of the tour, since we were standing in the space where multiple Canadian men were murdered, most of them being Nova Scotian. We then were in Normandy and had a tour of the Juno Beach Centre, consisting of the bunkers, museum, and beach. 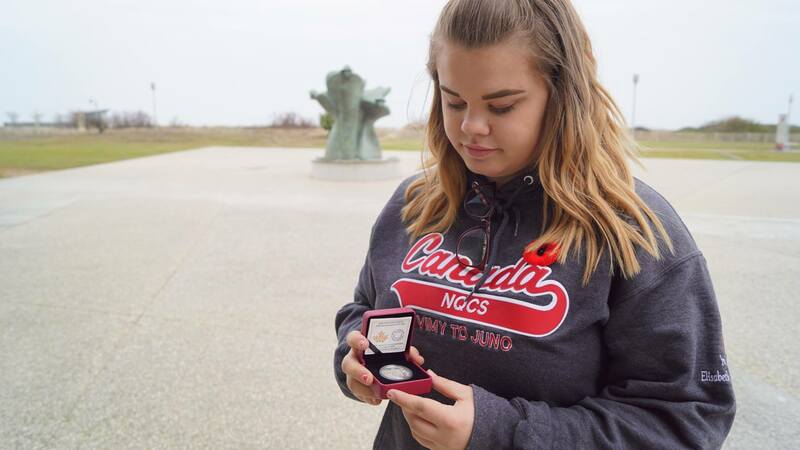 One of the students from my school had a relative that fought at Juno Beach. It was amazing to see her make that family connection there. We stopped and had a nice lunch in Arromanches. 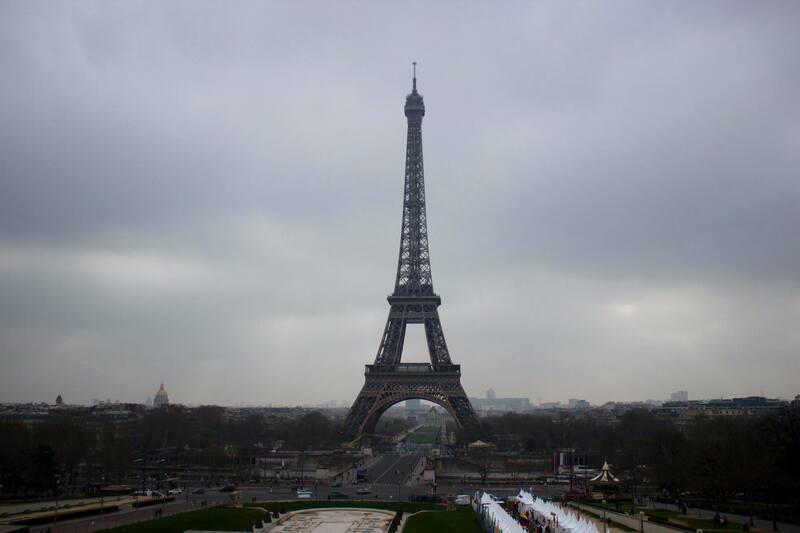 A 4 hour drive took us to Paris, where we had supper and then visited the Eiffel tower! It was a great experience to share with some of my best friends. 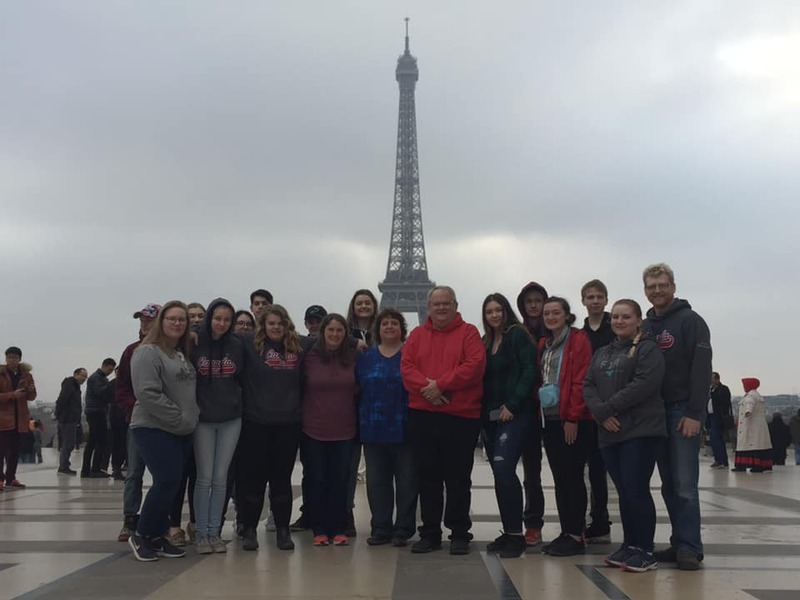 Our last full day of the tour began with a bus tour around Paris, then we went with a guide to Versailles to visit the beautiful palace and learn a little bit about the royal family who once occupied it. Then we headed back into Paris to see the Notre Dame Cathedral. We had supper and then had a beautiful River Cruise on the River Seine in the evening, and even got to see the Eiffel Tower light up as we went by! All of us were upset to see the tour end, but were excited to get home to see our family. I can’t express enough how important I think travelling is. You learn so much about history, and yourself. I wouldn’t trade this experience for the world!